The Falcons seek the aid of the untrustworthy Wolfpack. Navarre slowly walked down the narrow winding path back towards the castle. The longships were nearly done and he was looking forward to leaving Garheim, but though he new it not, a dark shadowy figure dogged his steps. Mark of Falworth greets his fellow knights outside the great Council of Dalmanutha. Everybody knows the best vacationing spot isn't on one of the beaches of Loreos or in the forests of Lenfald. No, it's the beautiful, snow-covered mountains of Garheim. And that's where you'll find Gräehm Kendraic spending his time during the recovery period. Until he gets bored, that is. Gräehm Kendraic decides to take advantage of the break in fighting by claiming unoccupied towers along the Garheim border. This dock provides key supplies to the castle and surrounding regions from foreign lands. The construction of the wall had begun. One crew was hard at work digging several meters down for the footings to be placed in. Then the masons began to build the wall farther from the ground. Some of the spoil dug out of the ground was mixed with other rock pieces from the quarry and filled back in between the walls. The crane was in place now, making progress on the wall much faster and easier. The operators were in good spirits, having been freed from their job of pushing/shoving/dragging the stones up the scaffolding, and were singing as they walked around in circles to hoist another heavy load of filler rock and another passenger. Upon hearing that the fearsome Dwarves were coming for them, the population along the banks of the lake gave themselves up to despair. That is, until Ageven's representative Rex showed up. He immediately suggested to flood the caves and tunnels the dwarves were building. The city burghers and the nobles around jumped at the idea, but didn't feel like getting their boots dirty, so Rex went around to the merchants in the area. These, quickly realizing that the green tight trade would languish without the lake's population, volunteered for the work, and soon a band of apprentices, armed with shovels, crossed the lake and began to dig. The rebel forces had grown much stronger in the safety of the forest. Unfortunately, their numbers had attracted the attention of the Royal Kingdom. 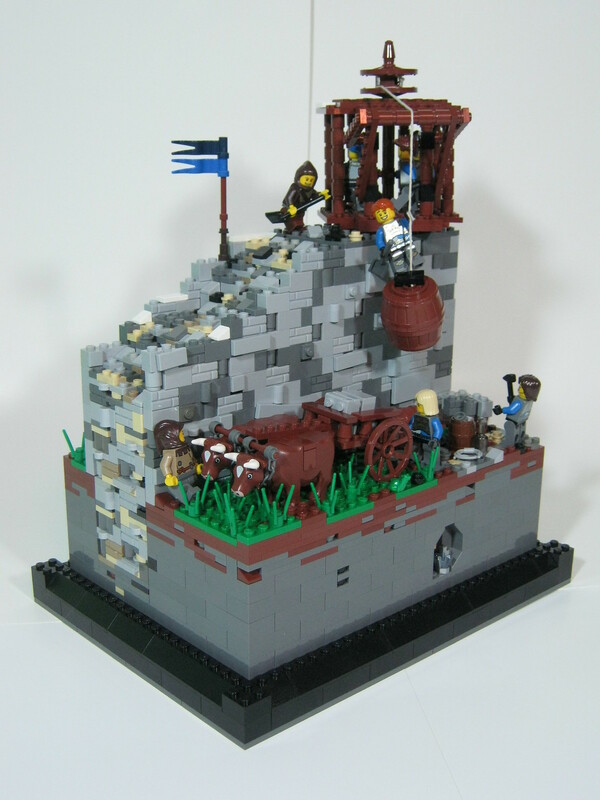 The rebel’s fortress proved ineffective against the pitch, torches, and superior numbers of the Royal Forces. The siege did not last long. The rebel forces fought valiantly, but in the end, all that was left of their force was scattered bits timber and ashes. Grimnir keep is on a very small plot of land. Home to Lars Grimnir. He has spent years collecting rocks to build it on the land he inherited. Now that its nearly complete he is seen as a stronger influence in the land and has been invited to meeting. Monastery located on the top of a rock with two different bell towers, surrounded by singular trees and beautiful flowers. A special minifigure was added for upcoming celebrations. Possible best known for leading England in its defeat at Bannockburn by the Scottish and his friendship with Piers Gaveston. Known for mysterious disappearance in the tower with his brother in the tower at the hands of his uncle. At the age of 12 his father, Edward IV, died suddenly. The will of the dead king nominated his brother Richard as Protector during his son's minority. At the time of Edward IV's death his son had been in the west of England and his brother in the north. They met outside London and 19th May 1483AD Edward V took up residency in the Tower of London, along with his brother Richard. Richard (III) delayed the coronation of the new king. Meanwhile a preacher claimed the marriage of Edward IV and Elizabeth Woodville to be illegitimate, thereby removing Edward V's right to be king. A small keep sitting on a peaceful hillside. Wait, did you expect there to be some epic story here about the build? A soldier cradles his dying comrade in anguish amidst the rubble of their breached city wall. Sir Ian Ferguson and a small group of stalwart hunters trudged solemnly down towards the Dunharris docks, carrying bundles of spears and torches. The grey, overcast sky blanketed an ominous feel over the procession. He readily agreed to join the band of hunters against the unknown menace beneath the surface of the murky waters. He had grown to feel Dunharris as a sort of home, and whatever challenged its safety ignited his anger. As they began to lower themselves into two rowboats through the gaping the railing, he felt a firm hand on his shoulder. He turned and looked at Kvasald in the eyes. "Best of luck to you, Sir knight," the Jarl stated. "You will need to travel some miles out to find this beast. If a day has passed without your return, we will begin the search." Sir Ian nodded and clenched his jaw. "I will not fail." He dropped down into the rowboat with 3 other men waiting for him and saluted the Dunharris Jarl as the boat was paddled away. As the other boat began to creep out onto the water next to him, the waves lapped rhythmically against the hull, making the boat jump to and fro in the black water. Sir Ian leaned his head back and prepared for the hours-long journey out to sea with a growing into in his stomach. He glanced down at the chunks of meat they had prepared to bait their prey. Suddenly, with no warning, the water exploded in a fury of foam and an enormous, writhing, black shape burst from the water and launched itself toward their boat. Sir Ian recoiled, his senses blazing, and fumbled for a spear. The men on the dock and on the boat ignited in shouts and hoarse screams.Two of the men were smashed from his boat as the beast curled over the coracle, sending splinters spraying into the air. The little vessel lurched dangerously as the weight of the massive serpent pulled it forward. The scaly, spined body plunged again into the depths, sending a great spume of water over Ian. He, shuddering, held out a hand to one of the men trashing with terror in the water and lifted him dripping into the boat. "That thing will devour us all!" he cried. Kvasald, on the dock, sprung into action with a cry of: "Bring the bows! It is within range of the dock!" Men on the dock sprinted away. The massive body thundered out of the depths again, dangerously close to the second boat. Spears were hurled in a volley at the great black serpent, and one man on the second craft raised a crossbow, the heavy weapon ringing with a dull thud as the quarrel sped towards the monster. It disappeared once more, bubbles springing to the undulating surface. "Where'd it go?!" The shouts were repeated from the docks and the boats. Men began to return to the docks, running and bearing bows with broadhead arrows.The water churned violently to the left of Sir Ian's boat as the serpent burst from the water, coiling over the boat and knocking another two men into the waves. Sir Ian was ready this time and jabbed his spear into the sable hide. It was much harder than expected, and this time the monster's attack was not without consequence. The stern of the rowboat cracked and splintered under the enormous weight filling the craft with water. It slowly tipped and began to sink. <i> thatch thatch thatch!</i> a volley of arrows poured from the docks, but most glanced off the toughened hide with little accuracy. The capsized rowboat was being pulled further and further from the dock by the waves and the great serpent. Its constrictive grip tightened And the boat finally gave in, snapping asunder and throwing its remaining occupants into the waves. They paddled desperately for the second boat, which, too, was begin drawn out to sea. Sir Ian clambered aboard, only to be thrown screaming into the air as the monster's head rammed into the hull of the boat. He landed in the murky water and rose desperately to the surface. The others were floundering around int he water. He cast about for something to hold onto. Chunks of torn wood were bobbing in the waves, but his hand found a spear, the very one he had been wielding earlier. He grasped it and as a wave rolled over him and pulled him under, looked down into the murky depths. Terror engulfed him as he saw a great, black, tooth-filled maw rising swiftly towards him. Drawing his strength, he pulled the spear downwards and furiously smote straight into the gaping mouth, driving the iron point hard. Sir Ian was jerked backwards and landed on a start slab of wood, smashing the back of his head against a metal binding and losing consciousness. 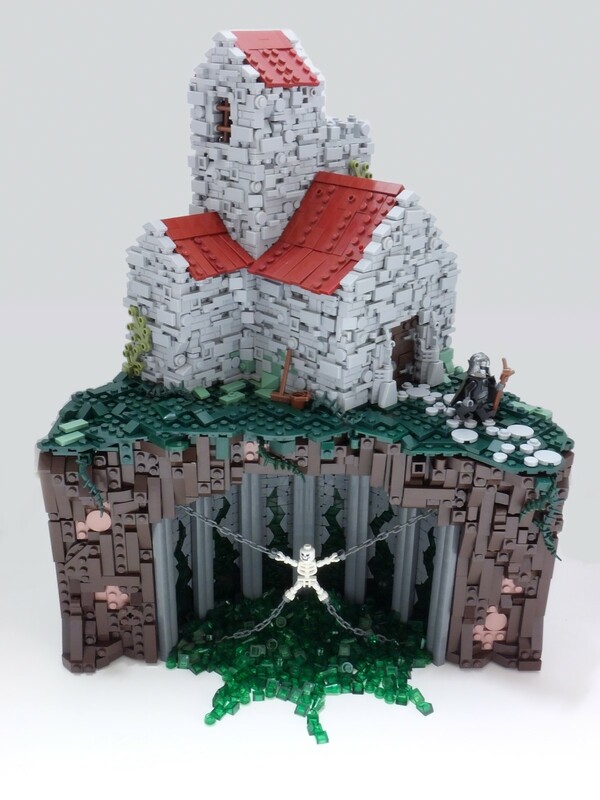 So this is my J2 entry to the LoR Hero's Guild for the Lands of Roawia on Merlin's Beard forums. This is also an entry to the "Small Miscellaneous" category of CCCXII over on Classic-Castle. The Dannegard city of Ironfort acts as a stronghold, guardian, and city, having many inhabitants. On a fine afternoon, guards vigilantly patrol the wall while the resident Baron takes a stroll outside the wall. Deep in the valley of Mordenkainen lives Fendrel Greybeard a Grand Sorcerer renown throughout the land and lands beyond the great sea. Children come from afar to bring him items for his spells as he pays the best price around His hunger for unicorn horn's as outstripped supply but thankfully one is about to arrive. The Tower of the Storms belongs to the Meteorologist - a wizard, who is the only one to harness weather and all natural powers. Don't you even dare to disturb him! During the Drow incursion in Avalonia, western Mitgardian army officials ordered hundreds of shafts dug to the bedrock for the early warning devices perfected by the Kaliphlinites. These devices were drums placed at the bottom of each shaft that, when the ground vibrated, beat seemingly of their own accord. If one was near enough to hear, the alarm could be raised and a Drow sneak attack from underground would be far less sneaky. Although no Drow tunneled to Mitgardia during the crisis, the drums were manned again on Elon Chorian’s command to listen for Amortug dwarves tunneling in the opposite direction. For no apparent reason, I really badly wanted to build a guy going walrus hunting, so here it is!